Generally crop conditions are good and most field work is on schedule. For the most part, a lot is now being cut. Good quality with lots of protein and most growers are pleasantly surprised with the yield. Some range in yields, where alfalfa without grasses is low yielding in thin stands. Fescue and ryegrass species seem to have improved winter survival, but yields are hard to measure accurately. 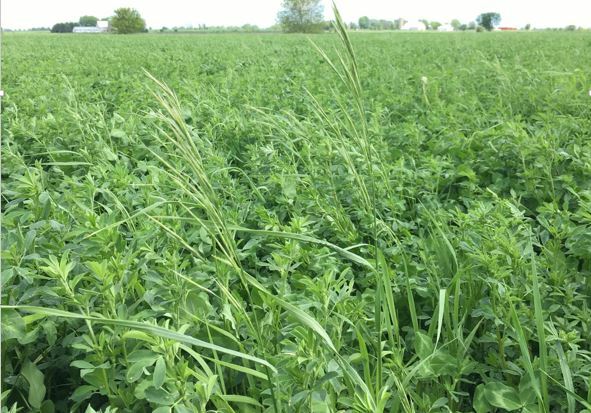 Little to no 1st cut alfalfa was sprayed with PRIAXOR® fungicide, as growers did not feel that the stand would yield well enough given the thinner stands. New seeding stands are looking alright, but some have thin spots where there is a lot of residue. Most new seeding stands have been sprayed for weed control. Most stands are well into the flowering stage now. Several growers are planning a two fungicide applications for Fusarium Head Blight control. A lot of the winter wheat crop is now being sprayed. Prosaro and Caramba fungicide trials are being done sequentially. One pass is done at the beginning of the flowering, then another 10 days later. There was a discussion that growers should use different fungicides with different active ingredients to reduce for resistance management. Not too many updates, other than the fields are looking variable. Most in the Zadok 30-32 growth stage. Weed control should be done by now. Plants are seen to have 2-3 leaves this week. The acres seeded in Canada has gone up. Swede midge pressure has been low to date, but are difficult to see as there very small. Growers are straying away from using Swede midge traps, as they are not as effective at predicting pressure levels. Most stands look good with the corn at the 6-7 leaf stage for most farmers. Some corn was showing yellow and red leaves last week. Cold nights and rain are making for yellow and purpling corn. Temperatures have been as low as 3 degrees. The cold nights do not influence Nitrogen recommendations, as soil temperature is still fine. The soil nitrate sampling is in full swing, with samples at 15-16 ppm, while others are 18-19 ppm. The average of the samples collected two weeks ago were at 12-13 ppm. This is slightly higher than the long term average, but not as high as in 2015. The OMAFRA Field Crop Staff report on the status of soil Nitrogen levels across Ontario is posted @ http://fieldcropnews.com/2018/06/nitrogen-status-in-2018-corn-fields/. One of the advantages of late applied Nitrogen is that growers can make better Nitrogen decisions later on in the season. The discussion was that more testing needs to be done on Nitrogen rates. Fields that went from damp to dry very quickly, are now down to 30,000 plants per acre. This is due to soil conditions, which are resulting in poor seed to soil contact, not soil pests. There is some herbicide injury, but it is quite minimal. There have been lots of issues with seeding depth, with lighter soils being cool and heavy soils being lumpy. The fall residue incorporation did not work well for this year. Residue management starts with the corn head. Chopping stalks is not always bad and trash whippers can help. In wet conditions, chopped residues move across the field. You can expect a lot of issues can be traced back to residue management, as it is difficult to manage lots of residue with fungicides. Some people found thrips on corn plants; approximately 10 per plant. In most situations, a low rate of liquid starters was used. Weed control is good, with most of the herbicides applied on time. There was a good window of opportunity to apply pre-emerge herbicides this year, so things worked well. Glyphosate resistant fleabane is coming our way, and some is already here. Growers should assume that they will have it soon. The stands have not been great, especially if they are planted on heavy ground (headlands). The growth seems to be slow. Plant populations are okay, but they are not too aggressive. Residue has been causing some issues, but stands that were planted in May look good. Some stands had to be replanted, because the initial seed was planted too deep at 3 inches in loamy ground. There was some dogbane in IP soybeans, where it is becoming more of an issue. Some seed corn maggots caused damage where there was no insecticide seed treatment used. Flowering expected to start in the next week or the one following. There is a lot of potential for white mould, so some people are starting to plan on how they will manage this. More growers are talking about using white mould fungicides in white mould prone fields. Two applications and good coverage are recommended for the best white mould control. The first application is recommended to be applied early about the R1 stage. The fungicides are effective for two weeks, so the second application is about 10 to 14 days later. IT IS IMPORTANT TO ALWAYS MIX UP FUNGICIDE MODES OF ACTION, to help prevent resistance. To verify upcoming deadlines, please visit the Agricorp page by clicking on this link.